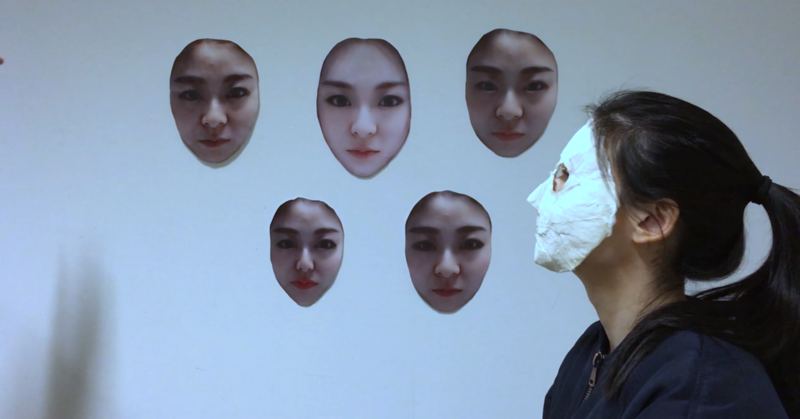 The relationship between elective facial surgery and feminism in China is at the heart of Su Yang’s short film Beauty, which recently won the Melbourne International Film Festival’s inaugural Powershorts Short Film Competition. Here, she explains why she made it. I was introduced to feminism for the first time in the US and became very interested in it, having not heard or learned about it properly in China. I was doing my MFA studies at the State University of New York at Buffalo at the time, having graduated from a Bachelor Degree in Design in at the Tsinghua University in China. When I went back to China from the US on vacation, I was confronted by the phenomenon of cosmetic surgery in China. Many people I knew, including a number of my relatives and friends, had undergone facial cosmetic surgery, and I saw advertisements for cosmetic surgeons everywhere: on TV, billboards and posters in our apartment elevators. It struck me that people had started cloning each other, losing their personal characteristics. And the notion of beauty in China seemed very singular to me, and the procedures for changing your appearance very oppressive. I decided to start my graduation thesis on notions of beauty and the phenomenon of cosmetic surgery among the female population in China. And after graduating I still wanted to continue my research because I wanted to know more, not only about feminism, but also feminist art and western feminist art theory. I read some Chinese feminist art criticism but it wasn’t progressive feminism – I wouldn’t even call it feminism – so I decided to move to Australia and continue my studies here. I was accepted as a PhD candidate at the Victorian College of the Arts in 2015, and am continuing my studies along this theme. The current working title of my thesis is Feminist Aesthetics: The Representation of Women in Contemporary Chinese Art. Recently I co-created a short film Beauty as part of my thesis research with my husband Zhang Xiaoan, who is also studying a Foundations Film course at the VCA. It won the Powershots Short Film Competition and will be shown at an exclusive Melbourne International Film Festival screening this month. It’s about one girl’s experience with cosmetic surgery. She goes through the process of choosing a new face from a number of different options presented to her. All of thee faces are actually my face adjusted on a phone app that’s very popular in China at the moment. Beauty (2017). Su Yang and Zhang Xiaoan. In the past, the trend in China was to look European but recently the aesthetic, I’d say, is not even human. The chin has become very sharp, and the eyes are very long and very round … the facial features don’t fit the face properly. So the character chooses this style of face at the start of the film. As the trends change, so too does her dissatisfaction with her now ‘outdated style’ of face. There have been many different understandings of feminism for ordinary people in China since it was introduced from the West in the early 20th century. The initial translation of the word in mandarin was 女权主义, which is close to ‘women’s-power-ism’. But in the 1990s, that word was seen to be too ‘man-hating’ and not aligned with Chinese values, which are underpinned by Confucianism – quite a sexist belief system. The core philosophy of Confuscionism is ‘harmony’, and people in China people believed that 女权主义 or ‘women’s-power-ism’ was too oppositional for the men. So the new translation became much softer, and much less feminist, in my opinion: 女性主义, which translates roughly to ‘women’s-feminine-ism’. This translation was supposed to be more in line with Chinese beliefs. When I go back to China I am still shocked about the state of feminism there. I went to an exhibition by a Chinese woman artist who painted three-inch shoes, from the times of foot-binding in the Tong Dynasty, in a romanticised way. I was so shocked to see these shoes, which are symbols of female oppression, celebrated in the painting. She painted the shoes like flowers, and talked about how Chinese foot-binding was a great part of Chinese culture. I believe this attitude is still able to exist because people haven’t had a chance to learn feminism. They should have access to this knowledge. I have spoken to young women and girls in China who, because of overseas travel and education opportunities and the internet, are learning a more progressive feminism. But it is not common enough. My current project is to identify and name a lot of these problems in China. For future projects I hope to help educate people in China about Western feminism. Banner image: Screenshot from Beauty (2017). Su Yang and Zhang Xiaoan. Well done. Love your ideas and the film. Great idea to raise awareness in China. It will be a worthwhile battle.